What is the ISLOGICAL Function? The ISLOGICAL function is categorized under Information functionsFunctionsList of the most important Excel functions for financial analysts. This cheat sheet covers 100s of functions that are critical to know as an Excel analyst. The function will test the value or expression provided and return a logical value. That is, it will evaluate the value or expression to provide a TRUE or FALSE result. ISLOGICAL is part of a group of functions called the IS functions, which are commonly used to test the result of formulas for errors. In financial analysisFinancial Analyst Job DescriptionSee a real Financial Analyst Job Description including all the skills, experience, and education required to be the successful candidate for the job. Perform financial forecasting, reporting, and operational metrics tracking, analyze financial data, create financial models, we often deal with numbers. The ISLOGICAL function is useful for checking errors in our data or analysis where we used some formulas. Value (required argument) – It is the value we wish to test as logical or not. Value can be a blank (empty cell), error, logical, text, number, or reference value, or a name referring to any of these, that we want to test. 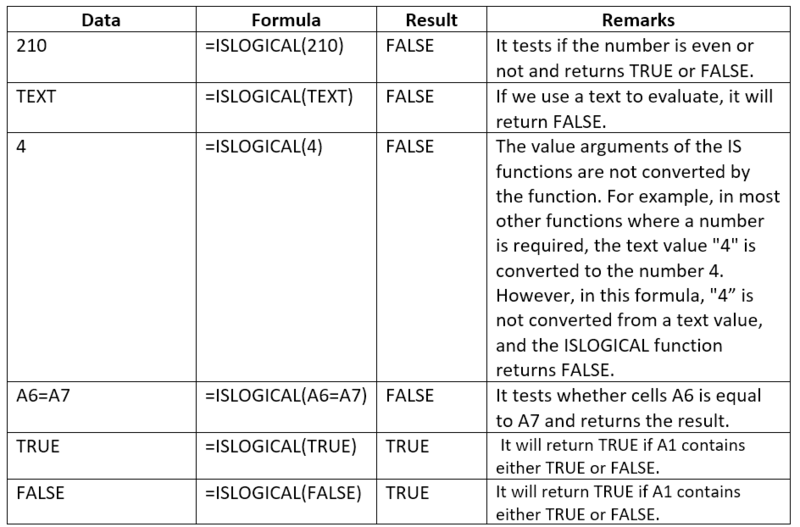 How to use the ISLOGICAL Function in Excel? The function returns FALSE for a blank cell. 1 and 0 (zero) are not evaluated as TRUE and FALSE. However, you can use the AND function to evaluate 1 and 0 and TRUE and FALSE. If the value provided us contains an error, ISLOGICAL will return a #N/A value.